This month, we are introducing the gorgeous Build-A-Flower: Anemone Coronaria! 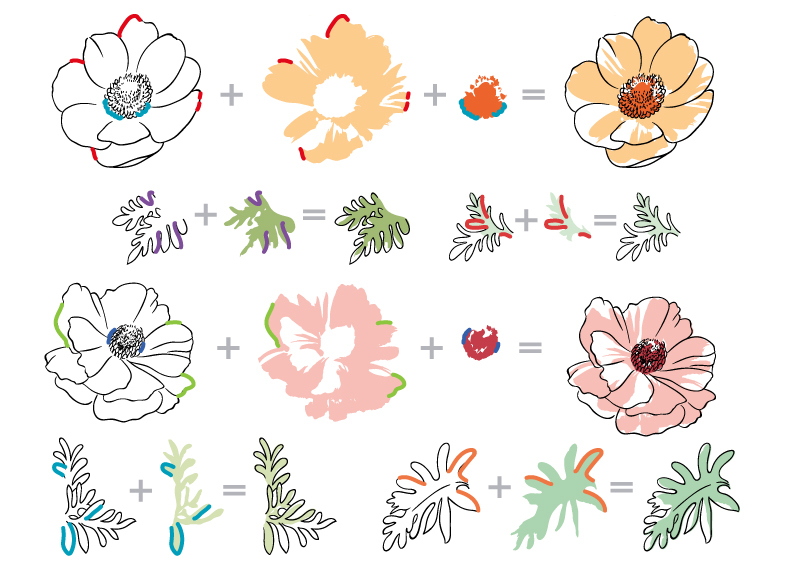 We also have a very special Build-A-Flower: Anemone Coronaria and Ink Bundle to make it easier for you to start creating beautiful projects. Get the bundle and save 5%! To celebrate this special release, we are giving away a $30 gift certificate to SIX lucky winners! Please leave a comment here on the Altenew Scrapbook Blog and/or the Altenew Card Blog for a chance to win. Six winners will be announced, three on the Card Blog and three on the Scrapbook Blog, on Friday, September 7th. We are celebrating this release with a fun blog hop! Some of our talented design team members and special guest designers have created stunning projects to spark your creativity using the new Build-A-Flower: Anemone Coronaria. We hope you love what they have come up with! Your next stop is the incredibly talented Norine Borys! September 2018 Inspiration Challenge + Video! I really love all of your stamps, but the floral designs are the ones that I always think of when I think of Altenew. These are gorgeous. This is such a lovely set that I just had to order it. Love this stamp set. The cards are gorgeous! Lovely stamp set. And the inspiration cards are gorgeous! Another beautiful flower set. Thanks to all the designers for their beautiful creations. Beautiful stamp set! Love the gorgeous cards! The anemone remains my absolute favorite flower dating back to 1970 when I lived in Paris and didn’t have much spare money. This stamp set brings back such nostalgia! Your cards add greatly to these memories! I thought the first anemone flower was pretty but this one is even better. I could look through these cards all day. Just so pretty! I just love anemones! Cant wait to see what the designers have created! Such lovely flower designs. Everyone should have this pattern in their inventory! This is such a beautiful set and captures the look of the flower perfectly!! I like that the flower has parts left white. Very realistic. Oh they are so LOVELY! Love the beautiful cards! Thanks for the inspiration. Loving this new addition to the Build a Flower family, so pretty! I really love this new stamp set. All of the cards and layouts on the blog hop are fantastic! Such a pretty stsmp set to go with all the other Build a Flower sets. I love these monthly stamp and dies. Another gorgeous build-a-flower release! Stunning images and beautiful sentiments. This set is simply stunning! Just love this new set and the designers have made so many lovely things. You guys are wonderful who make the beautiful stamp sets. I haven’t found one I didn’t like. This stamp set is gorgeous. LOVE YOU GUYS. Another beautiful stamp set! The cards are looking awesome!Thank you for the inspiration! Another beautiful flower to add to your Build a Flower collection. I like the option to layer or use the outline to color on our own. This is a pretty flower set and lots of great ideas. 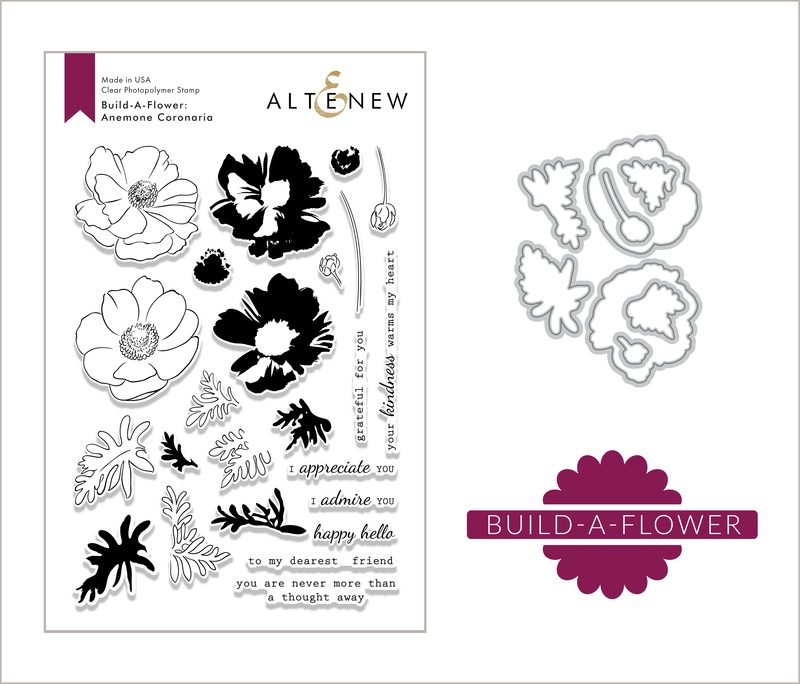 Love all your build a flower sets – thanks for creating! Beautiful stamp set! Lovely choice of flower and ferns! what a lovely stamp set. I am so impressed with the talented people who design for you. I love watching the videos. They spark my creative process. Thanks for sharing. Such a beautiful set! It’s my favorite Build-A-Flower set so far! My Altenew wishlist is growing by the day! What a beautiful Anemone Coronary set! Fab inspiration with this floral set. LOvely set of stamps! Outlines and detailed prints! Very inspirational! Love anemones, my go-to flower over the winter, because it is available in our supernarkets in all their lovely colors. Already ordered my stamp set!!! So pretty! I recently got a build-a-flower stamp set and can’t wait until I have/make time to play with it! The Anemone is a beautiful flower in real life and this stamp set really shows it off. Beautiful! Love the new stamp set and what you created with it. Love the purple. Love the new releases! Some of them can be used for more than just Christmas. Can’t wait to use them. Lots and lots of ideas brewing!!!! I sent for seed pods for this fantastic flower and the blooms are awesome. The ones I have are blue with the dark center. So naturally I had to buy the stamp and die set. Can’t wait to make a card (or many) cards with the set. This is by far one of my most favorite sets.